Questionnaires completed by 16,193 14 to 17-year-olds, published in BMC Public Health, showed one in five had tried or bought e-cigarettes. The researchers said e-cigarettes were the "alcopops of the nicotine world" and needed tougher controls. Experts said it was important to find out how many were becoming addicted. 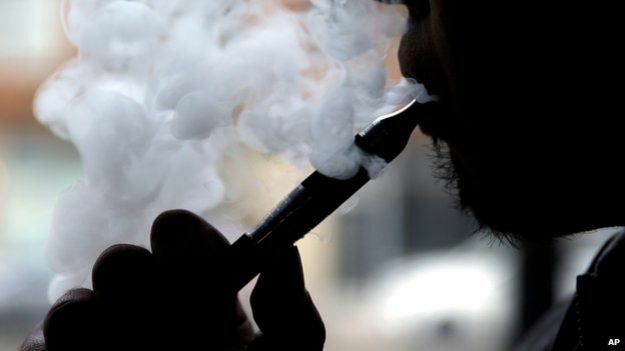 Electronic cigarettes mimic the effects of real ones, producing a vapour that is less harmful than cigarette smoke, but the vapour usually contains nicotine, the addictive substance in cigarettes. They divide opinion. Some see them as a vital tool for helping people to quit, while others argue they "normalise" smoking and may act as a gateway. One major area of contention is the impact they have on children. The analysis by Liverpool John Moores University showed that 19% of those who responded had tried "vaping". E-cigarettes were used by 5% of teenagers who had never smoked, 50% of former smokers and 67% of light smokers. The link was even stronger in children who drank alcohol or whose parents smoked. Prof Mark Bellis told the BBC News website: "To many people the numbers we've identified might come as a bit of a shock. "This is just being drawn into a repertoire - another drug that people can use to experiment with rather than being seen as an alternative to tobacco. On nicotine, he said e-cigarettes were "providing a concentrated form of a highly addictive substance, with known problems associated with it, and we need to be very cautious about that and how we protect our young people." A ban on the sale of electronic cigarettes to under-18s will be introduced in England, Wales, Scotland and Northern Ireland. Katherine Devlin, president of the Electronic Cigarette Industry Trade Association, told the BBC: "Obviously, teenagers accessing vaping products is a serious concern. "[However] since the survey only records a single access, it doesn't provide any information about whether or not they go on to regular use. "Other statistical data indicate that this is unlikely. Nevertheless, we hope that the newly introduced mandated age restrictions can reduce this number." Data from the Office for National Statistics does suggest that those who use e-cigarettes are almost entirely current or former smokers. Dr John Middleton, of the Faculty of Public Health, said: "We need to protect children and young people from the harms of nicotine by regulating electronic cigarettes. "Our concern is that if we wait for proof that electronic cigarettes could act as a gateway to smoking cigarettes, it will already have happened and the tobacco industry will have been given the opportunity to recruit its next generation of smokers."